Now that Valentine's Day is over, it's time to start thinking about St. Patrick's Day. 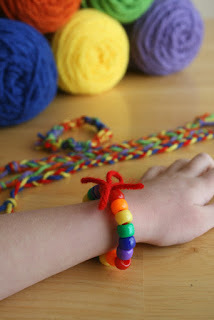 Alpha Mom posted some great ideas on creating Rainbow Friendship Bracelets. This is a quick, fun and easy projects your kids will love to do. They can easily make one for themselves and one for all their friends or classmates with just some yarn and beads. For the tutorial, simply click on the photo above.